Since graduating from AUT, Clinton Cooper’s career has taken him all over the world, he has earned multiple awards and worked alongside culinary greats like Heston Blumenthal. “Food truly is an international language. Having left New Zealand in 2000, I’ve lived and worked in 15 cities, in 13 countries, with some of the most creative, passionate and dynamic people around,” says the AUT culinary arts alumnus who has worked for top hotels on four continents, as well as famous Michelin-starred restaurants. Now working as the executive chef for Istanbul’s leading luxury hotel, Clinton is responsible for all aspects of food in the hotel. “Becoming an executive chef for an international five-star hotel is one of the achievements I’m most proud of in my career so far. This had been a long-time goal for me and a key focus since I started my career as a chef. Being able to inspire the next generation of chefs is his proudest achievement, Clinton says. He has always had an interest in cooking, Clinton says. 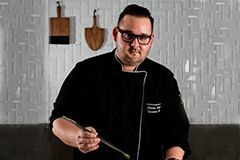 “Some of my earliest childhood memories are of being in the kitchen, so the decision to become a chef seemed like a natural progression for me. That’s why I decided to come to AUT. You have to be passionate about food if you want to succeed in this industry, he advises other students. *The Certificate in Professional Cookery is now incorporated into the Diploma in Culinary Arts.